There’s no doubt that the Milwaukee Bucks are one of the most exciting young teams in the NBA right now. With the upcoming trio of Jabari Parker, Khris Middleton and Giannis Antetokounmpo leading the charge for the young Bucks, is this the year that they make the transition from a young, upcoming team, into a playoff team? Two seasons ago, the Bucks finished 6th in the Eastern Conference with an even 41-41 record for the year. The return to the playoffs put Milwaukee back on the map, but were ultimately beaten in the first round by the Chicago Bulls. The following summer, the Bucks flexed their muscles in free agency by acquiring big man Greg Monroe. Being one of the bigger names of the 2015 free agency, the young Bucks made their intentions quite clear, that they were aiming for the playoffs once again, and his experience and ability would help develop and improve the Bucks at the time. With a new and improved team, the prospects looked to be bright in Milwaukee, but the 2015-2016 season didn’t go to plan. The Bucks slipped to a 33-49 record, leaving them bottom of the Central Division, and 12th in the Eastern Conference. Despite a disappointing season on paper, Jabari Parker began to show glimpses of his true potential. He featured in 76 games last term, compared to his 25 appearances in his rookie year. He averaged 14 points per game, as well as 5 rebounds and 2 assists. His explosiveness and energy proved to be a major force in the Bucks offence, and the 6’8 forward is already tipped as a dark horse for the Most Improved Player of the year award this coming season. Despite Parker’s development, it was the performance of the ‘Greek Freak’, Giannis Antetokounmpo, that stole the plaudits last season. Giannis finished with season averages of 17 points, 8 rebounds and 4 assists across his 80 games last season. To go along with Antetokounmpo’s impressive stat line, at one stage in the season, he scored 242 points, grabbed 114 rebounds and handed out 104 assists. The only other player last season to have stats even close to Giannis over the same stretch was Russell Westbrook. Giannis out-performed any other player in Bucks history over the stretch of triple-doubles and near-triple-doubles. Even Bucks legends and Hall Of Famers Kareem Abdul-Jabbar and Oscar Roberson never came close to a stretch of consistent performances quite like that. He was simply unstoppable. Jason Kidd made a tactical decision which proved to be an NBA game changer. He allowed Giannis to run the point, and he couldn’t be stopped. He made the game look easy with his speed, length and passing ability. Standing at 6’11, the NBA only have 2 players who have these sort of traits, the other player is Kevin Durant. With Giannis running the point this season, if he plays anywhere close to how well he played last year as point forward, the Bucks should be in for a very exciting season. Could we finally see Giannis in the All-Star game? Can the Bucks make the playoffs with their length and speed? 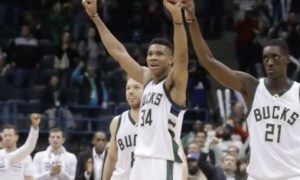 Could the Milwaukee Bucks, at long last, ‘Own The Future’.